Yet another Italo-Scot from North of the Tay [I have a certain fondness for Italo-Scots by virtue of 'being one' just the grandparents were the wrong way round for me to get a cool name], who came south to play for Falkirk. Peter Cabrelli started off as a nippy wee Inside-Left in School football in Dundee before moving swiftly into the Tayside junior scene with Dundee Osborne. He was soon picked up by Dundee FC but never managed to break into the first team. He knew the score and quickly moved onto Forfar where he started to show what he could do. 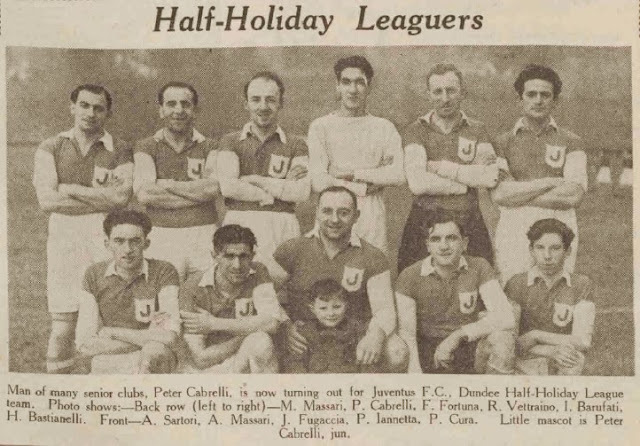 During his period at Forfar Peter also spent time with family back in Italy where he played matches with Borgotaro, Genoa & Ambrosiana Milano [better know today as Inter, but Mussolini had impelled clubs to use 'Italian' names], it was reported in the Courier at the time that the Milan club offered him profesional terms as a player/coach but he turned them down due to commitments at home. Soon the clubs came scouting in Forfar trying to lure him down South, Chelsea and Manchester United being amongst the big names mentioned, but when it came to signing his first full-time deal he made the only obvious choice: turning down such fly-by-night teams to take a chance at being allowed to play on the hallowed turf that was Brockville Park. Peter was moderately succesful in a pretty poor Falkirk side which was facing what would be their first ever relegation. Peter started the next season at Inside-Left but soon found his place being taken by David Cowan [who was it must be said a more consistent scorer] and instead of staying on the sidelines Peter finished the season on loan to King's Park. Falkirk had signed more forwards for the next season and knowing he could not be guaranteed a first team place Peter moved on to Raith Rovers, who crucially moved him to the position he would later become better known for, they played him as a Left-Half. Peter remained with Raith until the war, when he was called up for national service. Throughout the war he seems to have played a lot of football, not all of which I have been able to track down. Along with Raith and a season with St Mirren, he played throughout the length & breadth of the UK depending on where he was stationed or when he was on leave. The clubs he played for that I have come across were Dundee United, Consett, Halifax Town, Millwall, Arsenal, Crystal Palace, Bradford City, Bradford Park Avenue & Reading. Known Career – Dundee Crescent, Dundee Osborne, Dundee [1929/30-1930/31], Forfar Athletic [1931/32-1934/35], Borgotaro, Genoa, Ambrosiana Milano, Falkirk [1934/35-1935/36], King's Park [1935/36], Raith Rovers [1936/37-1945/46], Dundee United [1939/40], St Mirren [1942/43], Consett [WWII], Halifax Town [WWII], Millwall [WWII], Arsenal [WWII], Crystal Palace [WWII], Bradford City [WWII], Bradford Park Avenue [WWII], Reading [WWII], Dundee United [1945/46], Arbroath [1946/47], Montrose [1946/47-1947/48], Dundee Juventus.